For reliable data on pollutant emissions from construction products both validated testing procedures and qualified testing bodies are required. Test methods for determining the release of dangerous substances from construction products have been available in Europe for some time, and the first designated testing laboratories for this purpose have recently been set up in line with EU regulations. The free movement of construction products in the internal market has been a goal of the European Union for more than 25 years. For over 15 years, construction products with CE marking have been freely tradable in all Member States. Unfortunately, due to the lack of the required European testing procedures, it has not been possible to date to include information concerning environmental and health protection under the CE marking. Meanwhile, various testing methods for emissions from construction products as a European technical specification (CEN/TS) and as a European Standard (EN) have been published and can be applied to construction products in harmonised European standards for construction products or European Technical Assessments for construction products. Emissions from building products into interiors mustn't cause residents to fall ill as a result of polluted indoor air. To achieve an indoor air quality consistent with the minimum requirements, planners need reliable data on the emissions of all construction products used. For the data for different products to be comparable, they must be based on the same testing procedure. 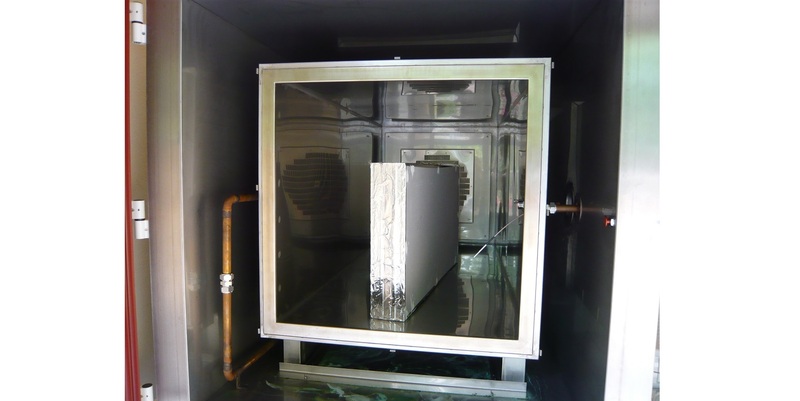 A harmonised European method for the testing of emissions of volatile organic compounds (VOCs) from construction products in indoor air, DIN EN 16516 (previously DIN CEN/TS 16516 from 2013), has become available in January 2018. From 2016 the European Commission has recognised a number of testing laboratories for this procedure which, pursuant to EU criteria, have been granted the status of notified bodies for testing according to CEN/TS / EN 16516. These testing laboratories can accept commissions from all construction product manufacturers who require EU-recognised test results for their products. What is still missing is the definition of a common declaration format for the provisional data on VOC emissions in the CE marking for construction products and the corresponding declaration of performance (specification of single values and/or allocation of the results to classes). The European Commission is currently considering whether to define classes for the declaration of VOC emissions (see Briefing: Reaching consensus on the assessment of construction product emissions). Should the European Commission fail to define any classes, building product manufacturers can provide information on the individual substances measured as declared values. The primary purpose of the DIN EN 16516 testing procedure is to harmonise mandatory VOC tests in the Member States of the EU and to make it possible to provide information on VOC emissions in the context of CE marking. It is also equally suitable as a means of establishing that voluntary criteria have been met, for instance in eco-labelling, or providing neutral information on emissions behaviour in environmental product declarations (EPDs). For VOC information in EPDs the UBA has drawn up a recommendation for the presentation of the test results. 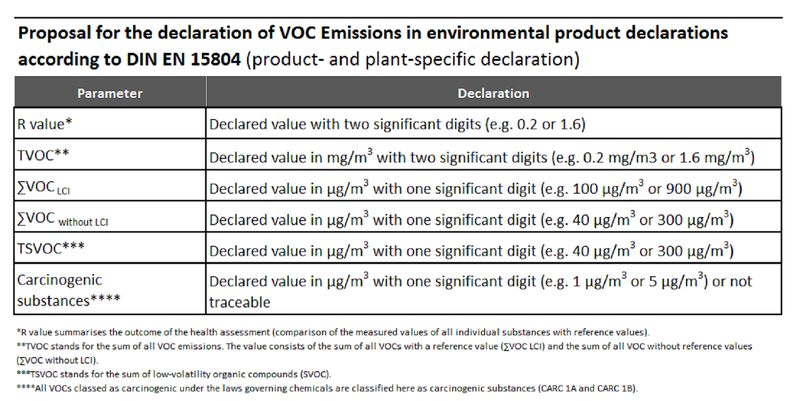 The attached Excel screen shows the UBA proposal for the declaration of VOC emissions in environmental product declarations according to DIN EN 15804 (product- and plant-specific declaration). From mid-2019 the German EPD provider Institut für Bauen und Umwelt (IBU) integrates corresponding indications on VOC as a mandatory element in its EPDs for building products that may contribute to emissions into indoor spaces. UBA recommends that all manufacturers of building products which release VOCs implement DIN EN 16516 in their product specifications now. It is in the interest of the users and of fair competition that transparent information on VOC emissions should become the market standard as soon as possible. An indication of VOC emissions in the declaration of performance accompanying the CE marking is mandatory from 2019 for all products with a specific standardization request from the European Commission. Here first successful implementations are urgently needed to promote appropriate solutions. The leaching of contaminants from building envelopes and infrastructure contributes to diffuse environmental pollution. To ensure that contaminant leaching from buildings does not undermine compliance with statutory environmental quality targets, planners need information on the leaching behaviour of construction products. To date, information on the contaminants contained in construction products and their release has only rarely been available. This is partly because suitable and generally acknowledged testing methods have only been in existence for a relatively short time and, on the other hand, there has never been any mandatory duty to provide information. One of the most important prerequisites for the provision of reliable and comparable information on the leaching of contaminants from construction products has been in place since the end of 2014. The DIN CEN/TS 16637-2 testing method applies to all monolithic, plate-like and sheet-like construction products (not suitable for granular construction products). A procedure suitable for granular products was published in December 2016 in the form of CEN/TS 16637-3. According to EU rules, testing bodies can now also qualify for these two testing methods. The European Commission lists the methods under the horizontal specifications in its NANDO database. Competent testing bodies can apply for inclusion in this database. Before the surface leaching test according to CEN/TS 16637 2 and column test according to CEN/TS 16637-3 are converted into European standards (EN), the Joint Research Centre of the European Commission has co-ordinated a European round robin test for the further validation of the methods. The inclusion of information on leaching behaviour in CE marking will become mandatory only when the required method is available as an EN. 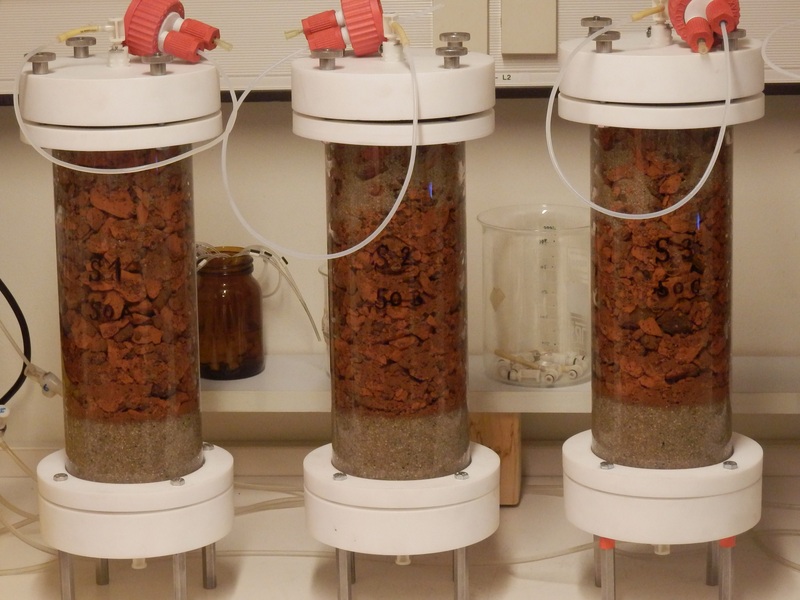 Until then, UBA recommends the voluntary use of the surface leaching and column tests. For EPDs in particular, declared values in accordance with CEN/TS 16637-2 or CEN/TS 16637-3 concerning the release of contaminants of relevance to the product would be an important and valuable addition. Such information would significantly increase the importance for environmental protection of EPDs for construction products intended for uses exposed to weathering. The standards group also includes CEN/TS 16637-1, which gives further information on the selection and implementation of leaching tests, and the terminology standard EN 16687, which defines the terms for the measurement and evaluation of the release of contaminants from construction products. In addition a series of harmonised methods for the analysis of eluates and extracts have been published in 2019 (see published standards of CEN/TC 351).